Multiples are really just shorthand versions of their longer and more tedious cousin, the discounted cash flow (DCF) analysis. A proper multiples-based analysis (also called comparables analysis) can take just as long—or perhaps longer—than a DCF. P/S multiple analysis is among the hardest to get right given the amount of information not captured in comparable company multiples. Even when not perfect (and they are usually not), multiples can still be useful; the key is to understand their limitations and proceed with caution. What is a multiple and a multiples-based valuation? Put simply, a multiple is a way of expressing the value of an asset relative to some financial (or sometimes operating) metric. In my example above, revenue ($100M) is the financial metric. The multiple (6x) is an expression of the company’s value relative to sales, which would be $600M in this example. If sales instead were $200M, valuation would be $1.2B. The key in a multiples-based analysis is deriving the multiple. Typically, we base the multiple on observed valuations of companies similar to the one I am interested in (“comparables” or “comps” in industry parlance), either through public trading activity, M&A or private market funding rounds. For this reason, a multiples-based analysis is often called a comparables (or comp) analysis. Put more complexly, a multiple is a shorthand version of a discounted cash flow analysis. 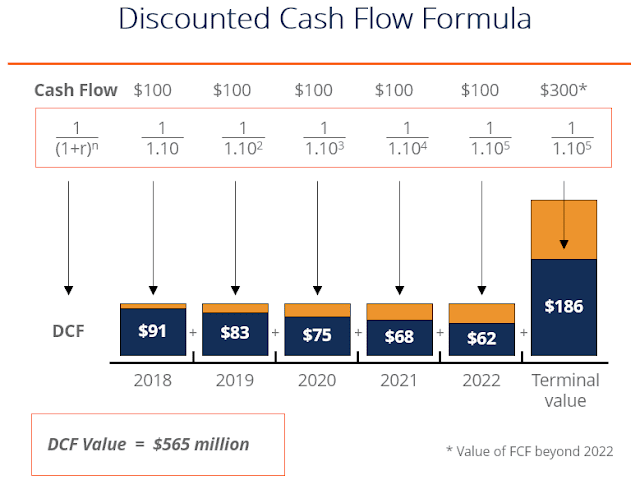 A DCF—which financial theory generally posits as the correct way to value a company—states that a company’s value is the sum of its projected future cash flows. A diagram of the approach is provided below. There are several steps involved in a DCF. First, we forecast a company’s cash flows out into the future. Then each future cash flow is adjusted by a rate that reflects both the time value of money (i.e. interest rates) and the riskiness of the investment. This is also called “discounting” the cash flows. Finally— adding yet more complexity—we also estimate a terminal value. What does that do? In theory, companies can last forever; yet, it's neither practical (nor possible) to explicitly forecast cash flows in perpetuity. The terminal value reflects the value of the company beyond the explicit cash flow forecast period. At this point, it may be evident why people prefer multiple-based analyses. DCFs can be lengthy and complicated. Predicting cash flows one or two years out can often be difficult enough; how do you project out five or even ten years? What is the right discount rate to use? I won’t even go into the considerations necessary to ensure a proper terminal value. Consider these examples: You are looking at two software companies with identical earnings next year (say $2.00/sh) but one is growing at 20% while the other is growing at 2%. You would probably pay more for the former; however, if you simply applied a comp (e.g. the average software-industry multiple… say 15x) to both companies, they may appear to have the same value. Or, consider two companies with identical earnings next year, but one has no debt outstanding while the other’s debt equates to 90% of its total capital. Debt is senior to equity and presents risk for equity holders. Again, you would probably pay more for the former company; however, the appropriate valuation differential may not be immediately apparent using a multiples-based approach. P/S multiples, which are pervasive in valuing VC-backed companies, are arguably one of the most difficult to get right. Why? Compared to earnings or other income metrics, sales capture fewer elements that should drive differences in valuation—most notably margins. Take our two software companies again. Both have identical sales (say $100), but one has 90% margins while the other has 2% margins. The companies have wildly different earnings ($90 in one case, $2 in the other), but applying the average software P/S multiple to both would falsely yield the same valuation. Margins (operating & profit margins). All else equal, higher margins = higher multiple. Growth. All else equal, higher growth = higher multiple. Financial leverage (debt). All else equal, higher levels of debt generally would lead to a lower valuation. Non-operating assets (e.g. the company owns its headquarters, which does not contribute to sales, but still contributes to company value). All else equal, a company with more non-operating assets would command a higher multiple. Management team. All else equal, a stronger management team = a higher multiple. Transparency. Higher transparency with investors = a higher multiple. Even if you don’t do a full DCF analysis, it’s useful to understand the formula and how its various components impact the value of one company relative to another. Is growth higher or lower? Does a more competitive landscape present a risk to future earnings and cash flows? What are margins like? Various internet resources may be helpful here. One of our favorites is Dr. Damodaran at NYU. See some of his notes on DCF valuations here. Multiples are very well-suited towards relative valuation analyses. Say we observe software companies trade at 5x revenue, on average. You have the opportunity to buy shares in SmaSoCo, a small software company, for 4x revenue. You know that SmaSoCo consistently generates better margins and growth than its peers. Based on this information, SmaSoCo shares may be a good buy (better cash flow drivers, lower relative valuation). Always factor in a margin of error. In theory, there is a correct valuation; in practice, people rarely find it. Know where your analysis can go wrong and use appropriate caution. In times of market dislocation (see our post on a topsy-turvy market), a wider margin may be prudent. Stay tuned to our Blog and browse the Knowledge Center for more insight on all things finance, investing, and private markets!